Finding a job is an exhilarating, exasperating mess. You think you’re about to get the perfect everything with five weeks of vacation and a company card and it falls through. You know a guy who knows a guy who can set you up, and the opportunity fades away. The jobs on Monster and CareerBuilder that you know you’re qualified for are few and far between, while the ones that pique your interest are at places you know won’t be interested in your 2.1 GPA and standing beer pong record at the frat house. Or maybe you were a stellar student, loyal employee, and research machine who just isn’t the best under the bright lights in front of a panel of judges. Wherever you’re coming from the basics don’t change. At the end of the day, and well before the beginning of the interview, you need to have a few principles tucked away. Doing the legwork beforehand by organizing your efforts, using every resource available to you, and interviewing before you start interviewing will get you into a corner office, or tiny cubicle, in no time. All the homework you skipped during college in favor of social growth didn’t set you back all that far. You waltzed into midterms and finals with enough upstairs to get you by. But the big leagues are calling your name now. And they want someone who is prepared. It’s time to get down to business on your own before any companies will hire you to. Organization is the name of the game. I’m a list man. I have them for everything, job hunts included. A good place to start, and the lists you should be thinking about compiling, are potential businesses, job sectors, and areas you’re prepared to work within, companies and geographically. When you get down to the monotony of applying online, and through recruiters, it’s even more essential to have a clean record of where you’ve applied, when you sent applications out, and what was entailed in the application. Some companies will require pseudo tests to be taken, personality exams, samples of the work you should have a working knowledge of, or systems you’ll use. Others will ask for open responses, specific types of references, or your favorite color. When you’re completing the millionth application it can be easy to just hit submit and find the nearest drinking buddy. But when the calls come in you’ll wish you remembered that you said you could fly and now have to prove it. The overachievers will make a spreadsheet of everything entailed. The underachievers will neatly mark everything down on a napkin for safekeeping. The easiest way to keep everything is a combination of the two. I keep a basic record of what’s going on with a yellow legal pad – it’s very important to use yellow – and take a screenshot of the job description and any important info along the way. I save each screenshot as the job title and application date. Screenshots are easy enough using shortcuts. With Windows 8 you hold down the Windows key and Print Screen and the screenshot will automatically save into the Pictures folder in your Library. With a Mac you hold the Command key, Shift key, and the number 3 to save the screenshot directly to the desktop. You can then move them to an interviewing/applications folder for easy reference later. However you get it all down, just make sure that it’s easily accessible. You’re going to reference it later. Often times it isn’t the job you expected to be referencing. Those are undoubtedly the ones we’re not prepared for. So when an email or phone call asks for explication on a particular you’ll be ready with everything at hand instead of asking if the job is in San Francisco or Boston. When you’re completing the millionth application it can be easy to just hit submit and find the nearest drinking buddy. But when the calls come in you’ll wish you remembered that you said you could fly and now have to prove it. Get everyone involved. Your friends and family will know of places and people looking for help that you’ve never heard of. Add them to the list. An innumerable amount of jobs are never posted. Nepotism isn’t always a bad thing. Continue this networking on your own. Career expos are constantly going on around us. They might not always bear fruit, but they’re worth heading out to. The Career Services office at your alma mater is another resource many people don’t think to check out. Most school alumni associations also have events that act as great ways to make connections with people who are genuinely willing to help out other alums with a phone call or reference. At the very least you can grab a beer with a few old friends. While you’re tapping friends, family, and social networks for help you might want to take the time to seek out a headhunter or recruiter. A good, ethical, headhunter can be far more efficient in your job hunt than you. Her job is to find you one, and she gets paid when you do, so your goals are one in the same. But, as you search for the right headhunter, be careful. A few tips to find that special recruiter are to go for the industry specialist who knows what your job entails rather than the jack-of-all-trades headhunter who might not be so familiar with how you fit into the sector you’re shooting for. Treat the meetings and interviews like the real deal because they are. Don’t be late or unprepared. You’re less likely to be placed for a job if you’re unimpressive. Any prospective employer will undoubtedly see hundreds, if not thousands, of applications for each and every open position. In an era where one person can apply to a plethora of jobs online while sipping an ice-cold strawberry daiquiri, employers have to be wary. Which means you have to be prepared. 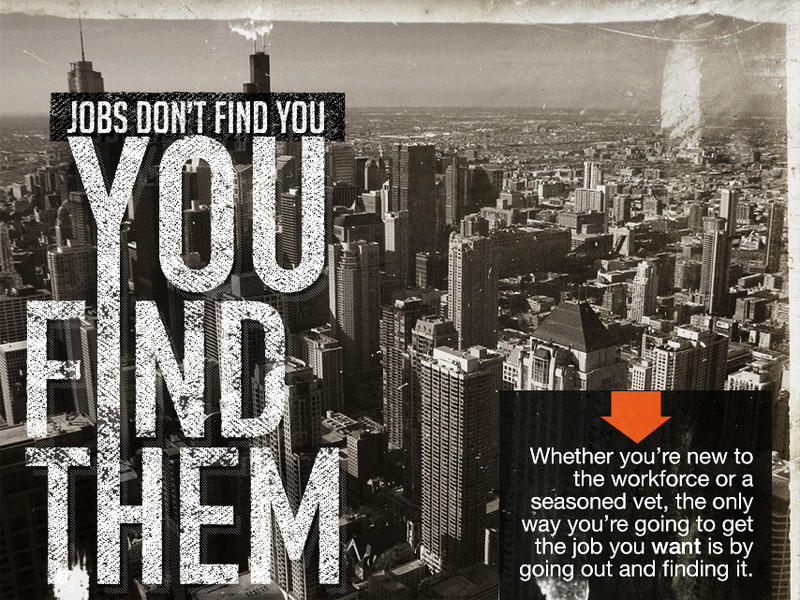 You already have a grasp on the market and what jobs you’ll be looking for. Now it’s time to get a working knowledge of those positions. When I was first applying for finance jobs as a senior in college I had no idea what to expect. I had a work-study gig in the treasury and business office at school, did well enough in classes, and looked great in a hand-me-down suit. But I didn’t know how to interview. The here’s-the-job-in-a-nutshell spiels from restaurant managers and retail store supervisors weren’t going to get me far. So I took my own advice and asked my family for help. They didn’t have a job for me, but had the next best thing. An informational interview with a higher up in the industry I was looking to sneak my way into. Informational interviews serve three different purposes, two that spring from the same idea: comfort. Often the single most detrimental aspect of interviewing is the discomfort associated with uncharted territory. You’ve never met this person before, don’t know the ins and outs of the job, aren’t familiar with the office, and, oftentimes, need the job. So your collar feels a little bit tighter, your mouth is a little more parched, and your brow glistens when it shouldn’t. The only way to alleviate some of that fear is by going through the process enough to get comfortable. This is where the informational interview comes in handy. The pressure isn’t as overt, but with still much to gain in experience and knowledge. There are many different types of informational interviews. The one I just highlighted was for me to get to know the market and interviewing process as an entry-level graduate. But for those of us looking for jobs in specific organizations, especially those that aren’t currently hiring, it makes sense to reach out to management, not just human resources, for an informational interview. There are a few things to keep in mind with regard to informational interviews. You’re actually there to learn about the company and interviewer so make sure to learn about the company and interviewer. Don’t spend an hour gushing about your life goals and never ever ask for a job. Focus on the interviewer and what you can learn from his career path and his working knowledge of the industry. My favorite question is what he wishes he knew starting out now that he’s succeeded. People love talking about themselves, and giving advice, so this question often gets the ball rolling and creates a good rapport. As for the rest of the interview, be prepared. Have a solid grasp on the organization so you can get down to the nitty-gritty without wasting your time or his. Either way, send a thank you, always, no matter what. Stay tuned for part 2: Nailing the Interview.